with an area of ​​100m2 habitable for 2, 4, 6 people. THE PRICE IS OF 110 € TTC PER NIGHTS FOR 6 PEOPLE. Available in all seasons throughout the year. COMPLETE July / August 2016. 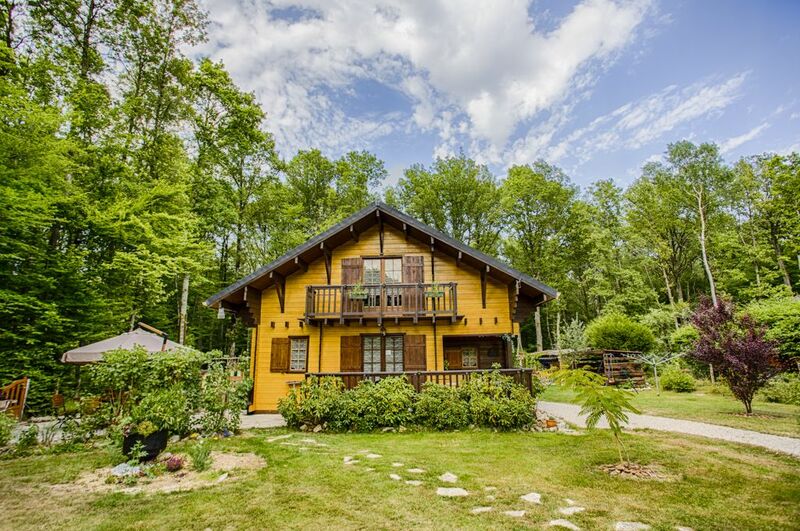 Located in a private estate in the heart of the forest, ideal for enjoying your family holidays, we small, relaxing, romantic getaway, birthday surprise, we extended, ex ..
Microwave, electric oven, gas 4-burners plate, traditional coffee + Senseo, raclette / stone grill, fridge / freezer, dishwasher 12 place, washing machine, dryer, 2 non-convertible sofas, tv / tnt, DVD player, corner bath, covered table and 6 people, table and iron, wood stove (firewood provided) and electric radiators in each room. Upstairs, 1 toilet + sink and 3 bedrooms; each equipped with a bed 2 places (140x190), bedside lamps and cabinets. several duvets / pillows / blankets are available in troubleshooting. Private parking, 2 terraces s' offer to you (a sun, the other shaded), each with a garden table with chairs, umbrella and barbecue. The pergola allows outside dining and so enjoy the same garden in the rain. A large sandbox, slide, cabins for children, trampoline, swing has ex .. are available in the garden and 2 adult bikes and a wagon to haul 2 children. 3 children bikes (10 to 3 years) and various toys are available. The heated above ground pool (6m x 1.20m octagonal) private and not overlooked is available right from the month of April. under the responsibility of the parents !! a non-permanent ladder is used to secure it. Deckchairs and a volleyball / badminton court are available in the garden. The chalet is a private individual dwelling without opposite located on the garden, fully fenced (children and pets can roam freely in safety in the garden). fishing, (5 stocked ponds in the area, the nearest is a 50M ((roach, bream, carp, perch, pike ..)) drill rides, roller rides, tennis courts, bocce courts, volleyball , table tennis, football ..
18 hole golf course open to the public equestrian club 3 km from the cottage. The chalet is located at 1:15 south of Paris by the A5 or A6 highway. and 1 hour of Orleans by A19 or A6. (exit Courtenay). - Castles of the Loire. - The castle and the forest of Fontainebleau. - 1h30 from Disneyland, Asterix park or Nigloland. - Recreational basic buthiers (ropes course, mini golf, swimming, climbing, surf simulator ..) has 40mn. - Souppes leisure base on loing and chalette sur Loing has 30mn. Available throughout the year and in all seasons. The tenant will bring his own bed and his toiletries. Dogs allowed (except al floor and in the sofa). Reservation check for 50% also serving uncashed deposit. View availability on the calendar (updated at each booking). - Announcement also visible on the website bnb air (with comments). Un petit paradis proche Paris. Wij hebben hier twee weken genoten! Het huis is van alle gemakken voorzien. Voor de kinderen van 3 en 7 jaar was er genoeg speelgoed. Het zwembad was ook erg fijn en schoon. Er was een probleem met de pomp en de eigenaar Stephane heeft het meteen verholpen. Stephane is dan ook erg servicegericht. In de omgeving is genoeg te doen. Het enige minpuntje waren de vele muggen. Er waren geen horren voor de ramen. Ik zou u dus ook adviseren om zelf een klamboe mee te nemen. U ziet trouwens bij de andere huisjes ook geen horren. Wij zouden het huisje zeker aanraden! Wij hebben heerlijk genoten van onze twee weken in dit prachtige huis. Het huis was van alle gemakken voorzien. Voor de kinderen was er meer dan genoeg speelgoed voorhanden. We hebben ons prima vermaakt. De eigenaar was ook zeer servicegericht. Er was een probleem met de pomp van het zwembad. Hij is toen meteen gekomen en heeft het gemaakt. In de omgeving zijn genoeg leuke uitstapjes te vinden. Het enige waar we last van hadden, dat waren de muggen. Er waren geen horren voor de ramen geplaatst. Dus dat was een beetje lastig. Ik zou u dan ook aanraden om zelf een klamboe mee te nemen. De woning zou ik dus zeker aanraden! For your family vacation, we small, relaxing, romantic getaway, extended weekend, ex .. Totally furnished and equipped: microwave, electric oven, gas 4 burners plate, traditional coffee + Senseo, raclette / stone grill, fridge / freezer, dishwasher 12 place, washing machine, dryer, 2 non-convertible sofa, tv / tnt, DVD, corner bath, table and covered 6 people Poel pellets and electric radiators in each room. On the first floor, 1 toilet + sink and 3 bedrooms; each equipped with a bed 2 places (140x190), bedside lamps and cabinets. several duvets / pillows / blankets are available in troubleshooting. Private parking, 2 Terraces s' offer to you (sun, the other shaded) each with a garden table with chairs, umbrella and barbecue. The pergola can eat outside and take advantage of the same garden in the rain. A large sandbox + slide and are for children shack available in the garden and several bicycles and a wagon to haul 2 children, and toys. above ground swimming pool is heated from May to September. (Octagonal 6m x 1,20m) private and not overlooked the responsibility of parents, not a permanent ladder can secure it as well as sun loungers and a volleyball / badminton court in the garden. The cottage is a private individual dwelling without opposite on his garden, fully fenced (children and pets can roam freely in safety in the garden). fishing (5 stocked ponds in the area, the nearest is 200m ((roach, bream, carp, perch, pike ..)) drill rides, roller rides, tennis, bowls, volleyball , table tennis, football ..
- 1h30 from Disneyland and Asterix and Nigloland park. deposit check uncashed 50% also serving as bail.